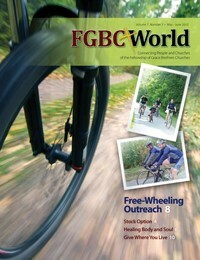 The May-June 2010 issue of FGBC World, the magazine for the people and churches in the Fellowship of Grace Brethren Churches, is being delivered this week. In it, you’ll find articles about a variety of ministries across the network of congregations that make up the Fellowship of Grace Brethren Churches, including a bicyling outreach in Martinsburg, Pa., a bi-vocational pastor in California with a ministry in China, and a free medical clinic in Delaware, Ohio. To read FGBC World online, see fgbcworld.com. If you’d like a free subscription to the magazine, send an email to amyers@bmhbooks.com or call 574-268-1122. And a shout-out to our advertisers in this issue… Momentum 2010, GBIM’s We Share, Celebration 2010 (national conference, Grace Brethren Investment Foundation, and Grace Village. As you support these organizations, thank them for supporting the ministry and mission of FGBC World.